The Clash Royale Private Servers are for both Android & iOS players. You can try different mods on Android devices and use XMod on iPhone. Join the servers now! Here are the latest Clash Royale Private Servers in 2019! Clash Royale is one of Supercell’s biggest launches just after Clash of Clans. The game has a massive following and it’s fun. It’s really fun playing the game and battling with other players. I started playing it in 2016 soon after the launch. However, I stopped playing for a few months and now, I’m back. Sometimes, it gets boring to wait for hours for chests to open. Most of us, won’t spend money to buy gems. But there’s a way to keep enjoying and unlocking new cards without having to wait. You can find the new cards like the Ram Rider, Wall Breaker, and many more. The newest private servers are finally here. You may also check our COC servers. I’ve combined the best servers for both Android and iOS players. I personally use iOS and I’m happy to announce, this works just fine. What are the CR Private Servers? Note: You can skip to the bottom of the page or click on the button below to find the download link to each of the servers. Firstly, I want to answer the question “what are Clash Royale Private Servers?“. CR Private Servers are custom servers for Clash Royale which has unlimited resources – gems and gold. You will be playing on a custom or modded server of Clash Royale. The official server by Supercell has definite rules to follow. This includes limited resources like gems or coins. You need to earn them to buy or unlock cards for your ultimate deck. Everything is same except that you have near-infinite gems or coins in private servers which can help you open chests immediately, buy new cards or even exchanging gems for coins. The possibilities are endless on these custom servers. These are some of the most interesting features of the CR Private Servers. Let’s see. Clans & the new clan wars. Getting the legendary items – cards and chests. Battling with other players in the server. Firstly, every great thing comes with a problem. It’s true these servers are super fun to play but they have some downsides. Well, it’s just a personal preference if you want to join these servers in 2018. You can open chests immediately. Learning to use higher arena cards. You might have to install the mod over your official Clash Royale app. Remember I said? These private servers for Clash Royale work on both Android and iOS. I’m going to tell how to get these private servers on Android and iOS devices separately. For Android, you can either use the server switcher or use mods. It’s easier to join the servers on Android devices. You can either download the Clash Royale mod or use the Private Server Switcher which requires root access. Even if your device is not rooted, don’t worry. You can still install the mod which doesn’t need any sort of SuperUser access. The server switcher modifies the host file and connects you to the private server. This requires a rooted Android device. This automatically modifies your host file and connects you to the private server of your choice. Then you can revert to the official Supercell server to get back to normal. 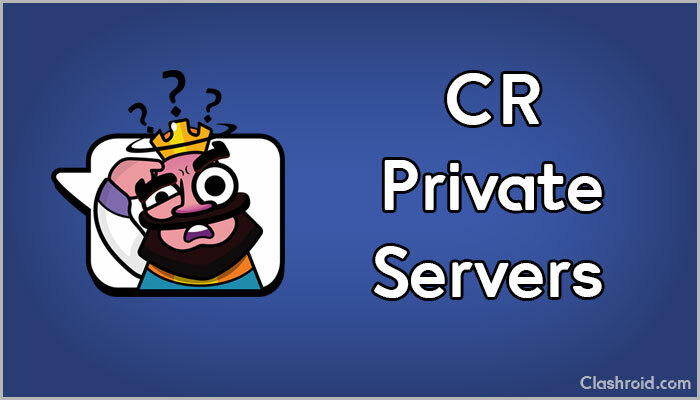 Download the CR Private Server Switcher. The FHX Clash Royale server is one of the most reliable servers I have ever tested. I tried this on Bluestacks which comes pre-rooted so it was no hassle for me. This will install a new app and your original game files won’t be affected but I recommend staying safe by logging into your Google account. When you open the game, this will take you to the private server. Download FHX for Clash Royale. It’s good to see that mods can finally be installed on your iOS device without a jailbreak. You can either use the good-old XMod or use the PlenixRoyale for iOS. The DNS never works but I’ll still provide them if you want to try. I recommend, installing the Clash Royale mod .ipa from TutuApp. I tried using the DNS servers on my iPhone 8 running iOS 12.0 and sadly, it doesn’t work for me. But I have heard some people who claim this works, so I decided to include them here as well. The mod IPA for Clash Royale is finally here. You can now install the mod on your iOS 12 devices without jailbreak. Go to Settings → General → Device Management. Search for ‘Clash Royale’ and install the ‘Clash Royale Hack’. Note: The XMod for Clash Royale doesn’t work with the latest Clash Royale versions, but you should try. The Clash Royale XMod for iOS requires a jailbroken iOS device as you need Cydia to install the mod. Go to ‘Sources’ and tap on ‘Edit’. Enter http://apt.xmodgames.com and tap on ‘Add Source’. Search for “XModGames” to install. Look for Clash Royale and download the modded IPA file. Pro Tip: You can also install XMod without jailbreak using your computer using the .deb file. I’m going to write a guide soon. Note: I won’t recommend using the DNS method because even for me, this didn’t work. The servers use specific UDP ports which might be blocked by your ISP. For the majority, this won’t work. If you’re super lucky, this might work. So, I’m giving no hopes. Now tap on the ‘i‘ icon beside your network name. Now start Clash Royale, wait for 5-10 seconds, this might work out. That’s how you can connect to the private servers on your iOS devices. For instance, you can see how easy it is with Android but if you jailbreak your iOS device, this will be just fine. There is still no mod for Clash Royale for iOS, but it’s going to be developed by someone for sure. I’ll make sure I keep you updated. Remember, CR Private Server Switcher and FHX Royale requires a rooted device. The Clash Royale Private Servers are updated according to the latest official updates from Supercell. I’ve provided the steps to join the private servers on every device. New cards like the Ghost, Magic Archers have joined the arena. You can instantly unlock your chests and get unlimited gems in Clash Royale for free. You can unlock most cards at ease and also receive chests like King’s Chests and other rare items. I have reached the Legendary arena and it’s really fun battling with the most powerful cards of the game. Found this helpful? Share this with your Royale friends. Comment if you have any questions. Hi Fated, did you download the mod? Hi Davonte, are you on iOS or Android?